Inhabits rocky areas of large rivers, including areas of whitewater. 4.8″ (12cm) is the official figure, although it’s reported to grow much larger. 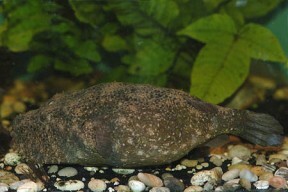 A biotope aquarium would consist of a sandy substrate littered with smooth, water worn rocks. Arrange these to provide some hiding places for the fish, and try to provide a moderate current through the tank. It can also be kept in planted aquaria as it will not chew leaves. pH: No precise details available, although at least one batch of fish was collected in water of around neutral pH. Assume a range between 6.5-7.5. Hardness: Again, no accurate data is available. Somewhere between 5-12°H is suggested. Relishes all kinds of shellfish, as well as worms and other live and frozen foods. It should be fed snails and unshelled shellfish (such as crab legs, mussels etc.) regularly, in order to maintain it’s sharp teeth. 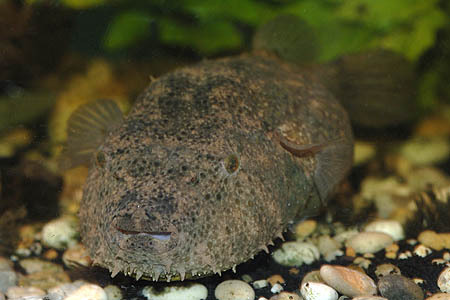 As with other puffers, these grow continuously and become a problem for the fish if they are not kept ground down. A generally aggressive and intolerant species that really should be kept alone. Its beak-like mouth can easily bite chunks from other fish, or in extreme cases rip them to pieces. It’s also very aggressive towards conspecifics and should never be kept in groups. Males are said to have a greater number of cirri (the hair-like growths that characterise this species) than females, but this is unconfirmed as others report that females do not possess cirri at all. Not thought to have been achieved in aquaria, probably due to its temperament (and pricetag!) restricting the number of hobbyists prepared to make a serious attempt. The hairy puffer is rare in the hobby, and tends to command a relatively high price when it is available. The exact nature of the cirri that cover the fish is unknown, but would appear to be related to gender, or possibly camouflage. 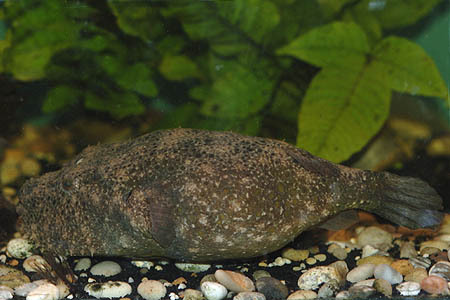 It can change colour depending on its mood, and, uniquely among puffers, is completely scaleless.